Children go through clothing faster than anyone else. Using one or more varieties of child mannequins we offer will help you increase sales of your businesses children’s apparel. 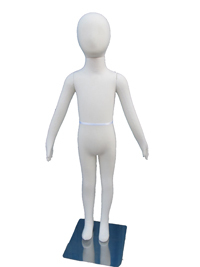 Bring a sense of family and fun to your businesses mannequin scenes, or display your children’s clothing with one of our adorable child mannequins by itself. This child mannequin represents a five year old. It features flexible appendages for a variety of different posing options. Perfect for displaying children's clothing and accessories. This child mannequin is that of a nine year old. It's flexible appendages help you create a scene using other mannequins or just all by it's self. This child mannequin represents a seven year old. I's bendable appendages allow you to make different action poses. This child mannequin represents a three year old. It is flexible so you can put it in many different poses. Perfect for creating scenes with other mannequins. This example of our unbreakable mannequins it that of a small boy. Kids grow out of clothing so fast and this mannequin's virtually unbreakable construction will allow you to showcase your children's apparel year after year with almost no signs of wear and tear. This version of our unbreakable mannequin series is that of a small girl. Children go through clothing so fast that it's necessary to have a mannequin that can put up with constant use, year after year. This unbreakable child mannequin does just that. Can my business or retail outlet afford these child mannequins? Our child mannequins our very affordably priced and a must have for any store that has children’s clothing for sale. Busy parents don’t always bring their children shopping with them. 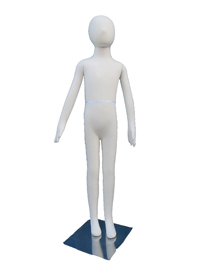 What better way for your business’s customers to see how fantastic your apparel will look on their children than with one of our child mannequins. How durable are these child mannequins? 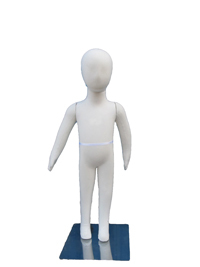 Our child mannequins are made of polyethylene, a virtually unbreakable form of plastic polymer, for many years of constant use in your rapid retail environment. XWhy do I need a child mannequin to display my businesses children’s apparel? Every parent knows how quickly children outgrow their clothes. If you sell children’s clothing these child mannequins are definitely a must have. They will help you showcase your new merchandise and showcase the items you have on sale, to increase your businesses sales and profits.